Initially appearing on the Arts scene in Madrid in the mid-Eighties, SpY has since come to be recognized as a perpetually exciting and elusive urban artist. Known for his observation and reflection of the built environment, he looks at urban settings in eye-opening and provocative new ways. Although the levels of pleasure and excitement that stem from witnessing his work are hard to summarise in words, his work is so thought provoking and endearing, not to mention relevant to our everyday lives, that they absolutely deserve being commented upon. WRAP, Cologne, Germany, 2013. Photo © SpY. GROW, Besançon, France, 2013. Photo © SpY. WALL, Berlin, Germany, 2012. Photo © SpY. 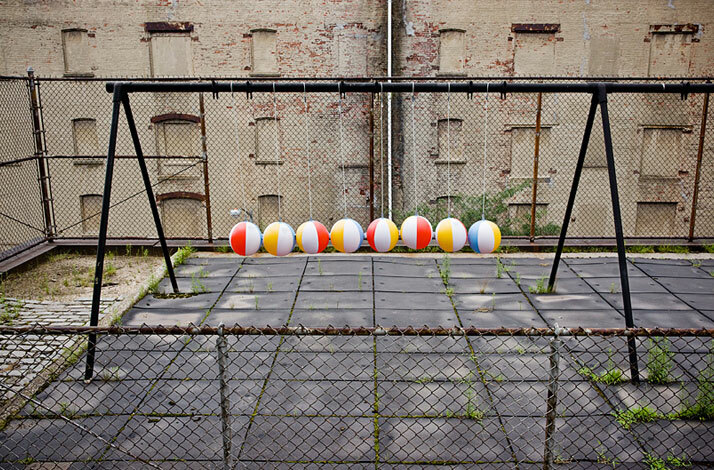 BALLS, New York, USA. 2008. Photo © SpY. 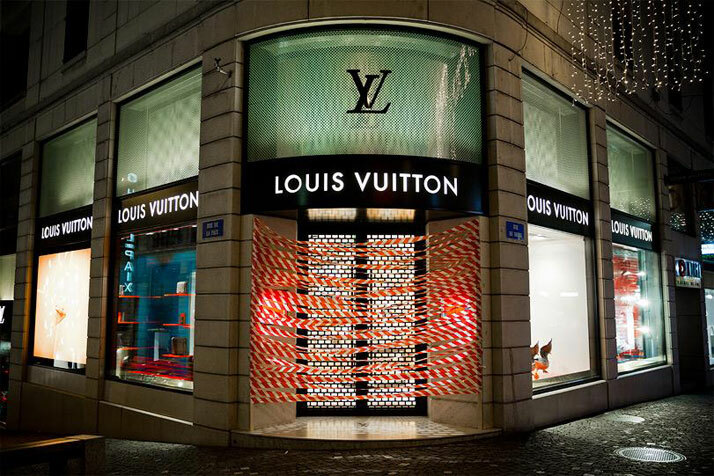 Lausanne, Switzerland, 2013. Photo © SpY. So where does one begin a discussion about an artist who is so unflinchingly smart and prolific? With the reasons as to why this artist is so demanding of appreciation perhaps. I say demanding, because what needs to be considered, first of all, is that SpY's work is brilliant because it doesn't so much scream for attention as simply exist; receiving attention by the bucket load as a result. 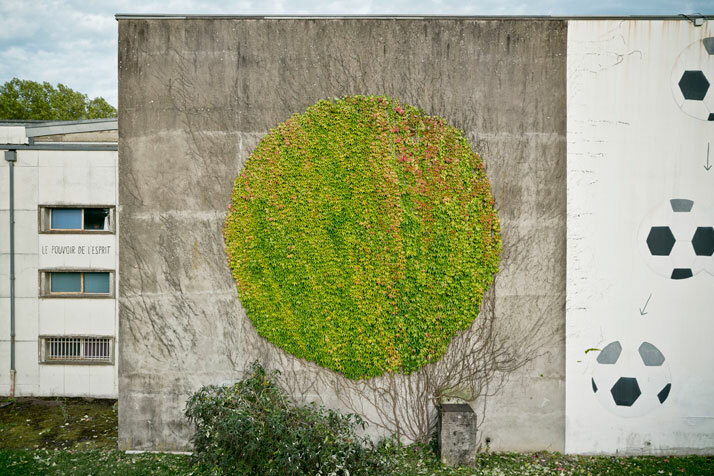 Take his recent work ‘Grow’, in Besançon (France), for example, where a partly pruned climber sits on an unsightly stark building offering a bold circle of organic pleasure upon a grave concrete background. Fundamentally organic, it has been shaped however, to force the viewer to do a double take. In looking at it more closely and the contrast that it exhibits, it becomes immediately apparent how the beauty of evolution and nature can transform the manmade and constructed. 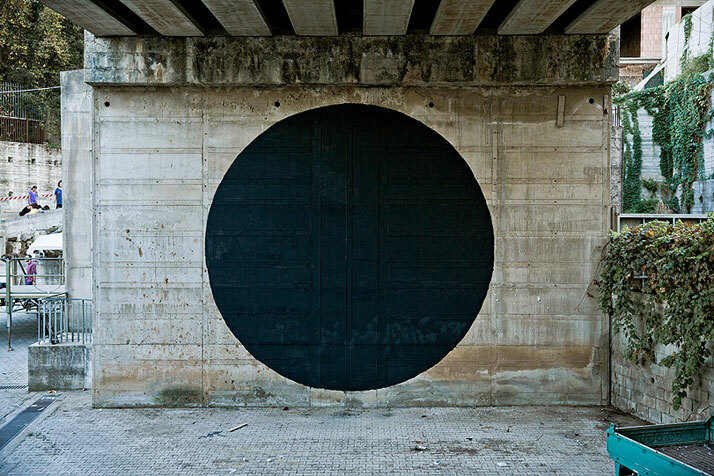 It reflects and furthers the idea behind his slightly earlier work ‘Hole’, a black circle painted on a bridge in a deprived neighbourhood in the city of Rosarno in the Calabria, Italy. The black hole almost looks like a tunnel into the unknown or a wonderland escape route into the less familiar. Created as part of A di Città Urban Regeneration Festival, this piece of works shows how something fresh and exciting can be stumbled upon in an otherwise rundown area that makes you stop and look around at an environment differently, no matter how first-handedly depressing it may be. In addition to creating installations that are bold, subtle and abstract, SpY also makes more visceral statements that force passers-by to stop and contemplate the strong messages he is conveying through use of dry humour and wit. 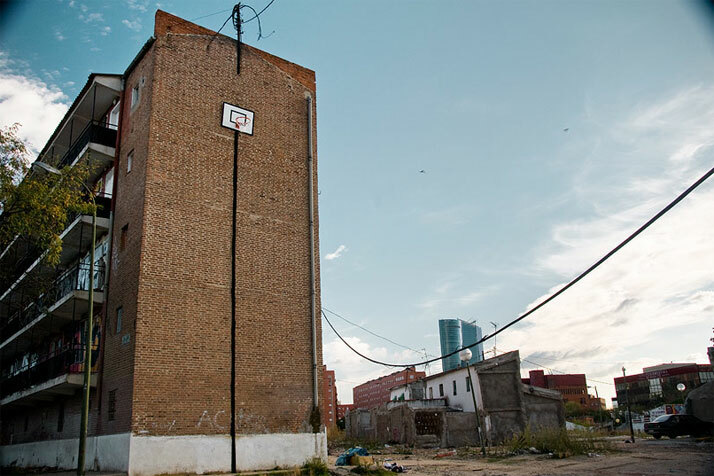 An example of this is ''ELLOS'', a billboard advertisement for art intervention during the 8º Asalto Art Festival in Zaragoza, Spain (2013). 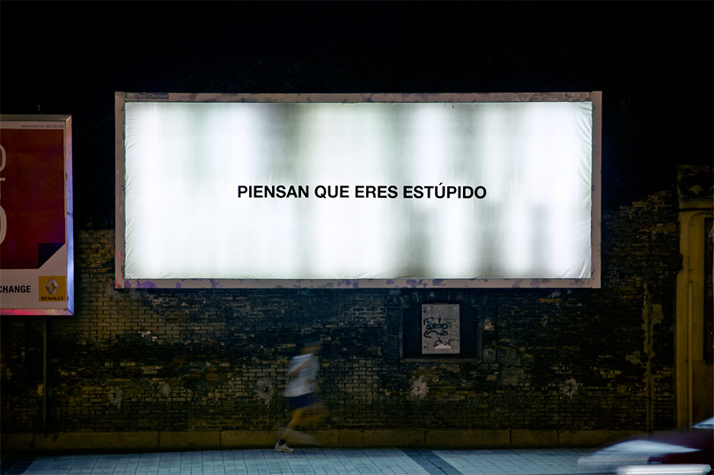 It reads ‘PIENSAN QUE ERES ESTÚPIDO’ (''THEY THINK YOU ARE STUPID''). This simple yet highly provocative statement throws into question ideas of hegemonic states of everyday consciousness by confronting the pedestrian with the idea of 'they', therefore highlighting the otherness of what we often unconsciously consume and passively accept as being our normality. It also provides the idea that by not acknowledging this consumption, we are actually facilitating and allowing manipulation to occur. The word 'think' however, offers us an opportunity to overcome this, in that it indicates that this reality is merely the perception and appropriation of those in control, and an inaccurate one at that. It is an empowering statement that, at first, can seem insulting which is, of course, why it's so astute. Interestingly, this piece was later rejected by the advertising standards authority which dismissed its installation for legal reasons. Finally, both parties reached an agreement and the billboard was erected in a central location in the city of Zaragoza. ELLOS, ''THEY THINK YOU ARE STUPID'', Zaragoza, Spain, 2013. Photo © SpY. 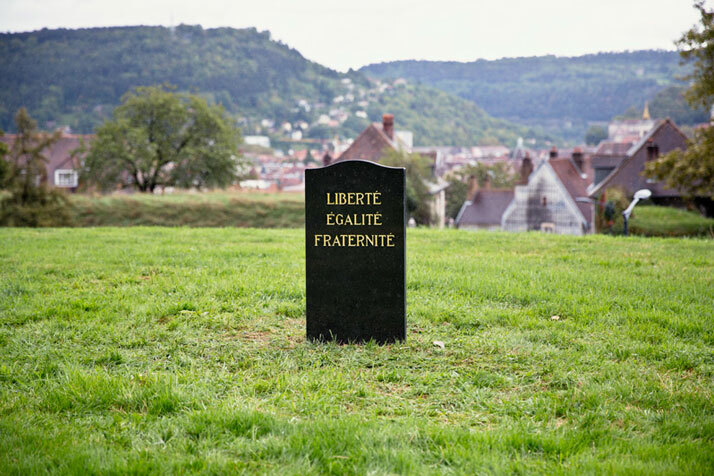 Installation of a black marble tombstone with carved letters covered in 24k gold with the inscription: Liberté, égalité, fraternité ''Liberty, Equality, Fraternity''. Besançon, France. Photo © SpY. 0 LIKES, Madrid, Spain, 2013. Photo © SpY. UPSIDE DOWN, Bilbao, Spain, 2008. Photo © SpY. 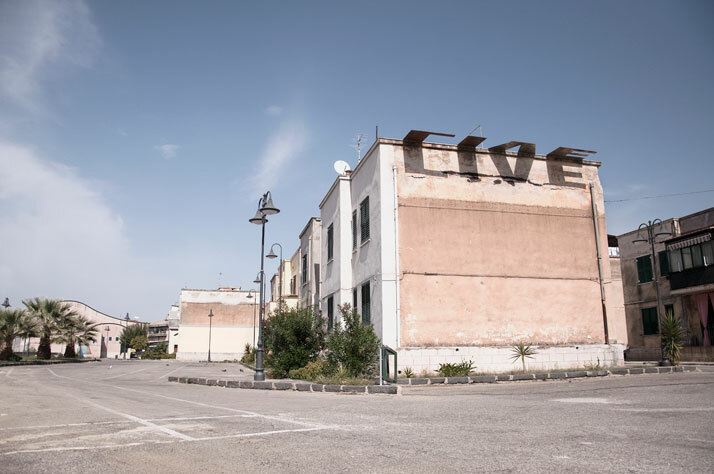 LIVE, Rosarno, Italy, 2012. Photo © SpY. SpY's most challenging piece is also his most recent. 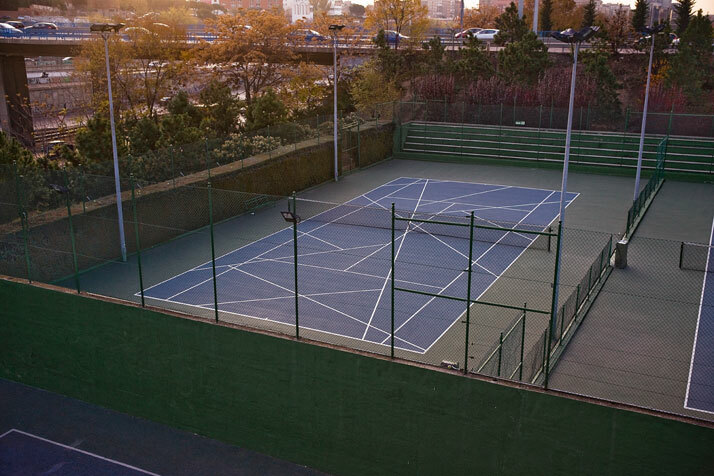 It’s challenging because this time it incorporates another human being, in this case a homeless participant named José María, who kindly agreed to collaborate after the intention of the intervention was explained to him. 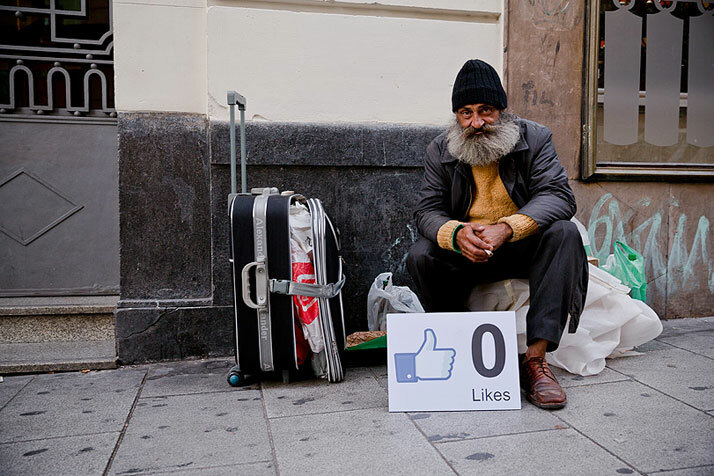 José María was asked to sit beside a sign with the message ''0 likes''. Questioning the emotions that stem from our relations to each other, this piece also looks at how we consume on an everyday basis. It questions how we objectify the things we come across (often in the simplest manner) and what we get from the knee-jerk reaction stemming from like and dislike, as encouraged by the social media vacuum that is Facebook. 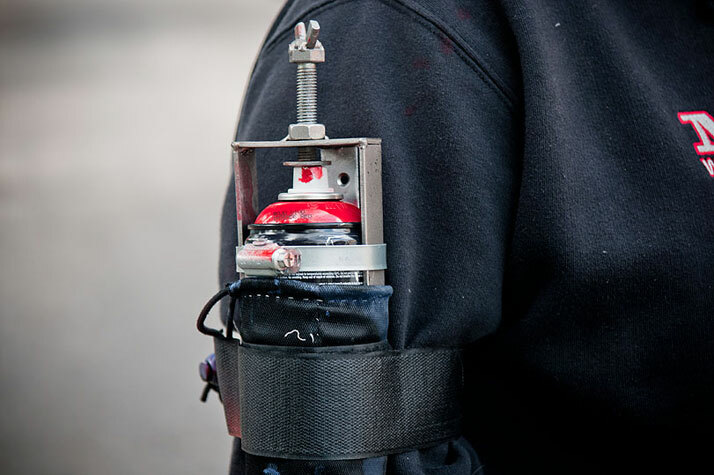 As we wonder the streets, we don't consciously press a button but rather suppress or just overlook certain feelings, choosing to simply not acknowledge anything we find painful or emotive, such as the physical existence of homelessness. SpY makes us reevaluate how we perceive everyday realities. He forces us to confront feelings that make us uncomfortable and not distract ourselves by engaging in a different online reality; in making us confront our feelings, we are forced to consciously acknowledge them and what really drives them. SpY's work is collective in its impact and environment but subjective in that it reaches out to every individual to be then digested through thought, experience and feeling. Although one could talk about his work forever, at the end of the day, it’s probably more constructive to simply encounter it and think about it. That is the reason behind its creation after all, and the reason why this artist has, and will, continue to make us look at our surroundings in a different light again and again, as we exist and venture out into our concrete jungles. Endnote: As I left my building, having written this article, I saw someone hurrying into the building. I held the door open for him for a little longer than usual. Acknowledging my neighbour for the first time and keeping the door open for him was a way of having a (fleeting but important) human interaction in my own busy city (London). I realized, as I walked away, that this was my own reaction to this artist's work and the value it offers. THINK, Katowice, Poland, 2013. Photo © SpY. Through his work, SpY shows us how cities, as spaces, can provide materials and a range of possibilities for creativity. 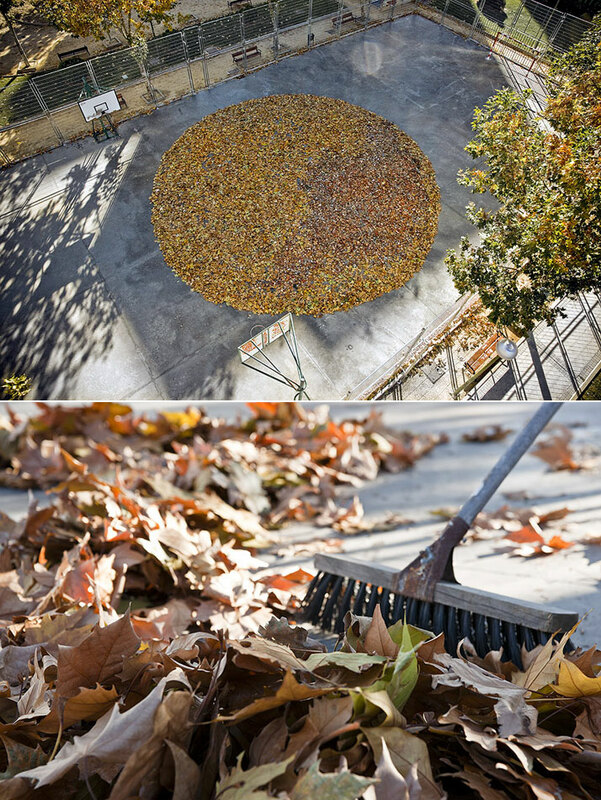 The results are potential shifts in perspectives, in the sense that what we see every day can be reimagined and re-recognised in varying contexts. 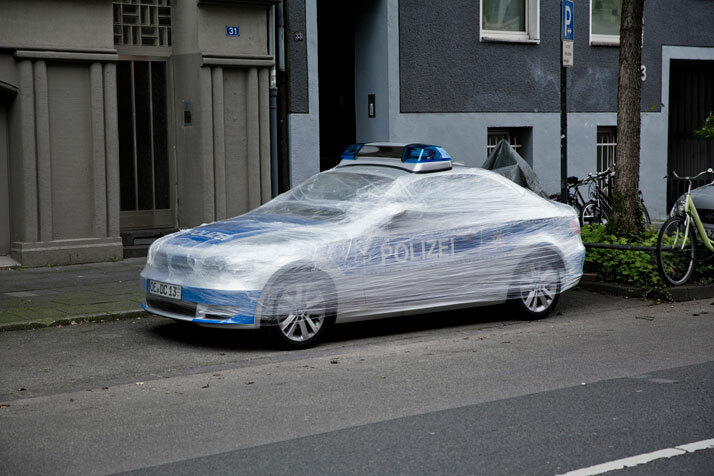 His piece ‘Wrap’, a German police car in Cologne that's been wrapped in cling film, is one such example; it makes you ponder on why and what could potentially happen if things that we are used to seeing became immobile objects with no function other than being looked at – thus forcing a sense of enquiry. He also makes the everyday more spectacular; definitely the case with ‘Piramid’, an installation executed in front of the contemporary art museum ''ARTIUM'' in Vitoria,Spain, as part of the ''Mutatis Mutandis'' 2013 program. This unusual formation opens up shifts in consciousness as SpY seeks to construct new ideas rather than detract from what already exists. 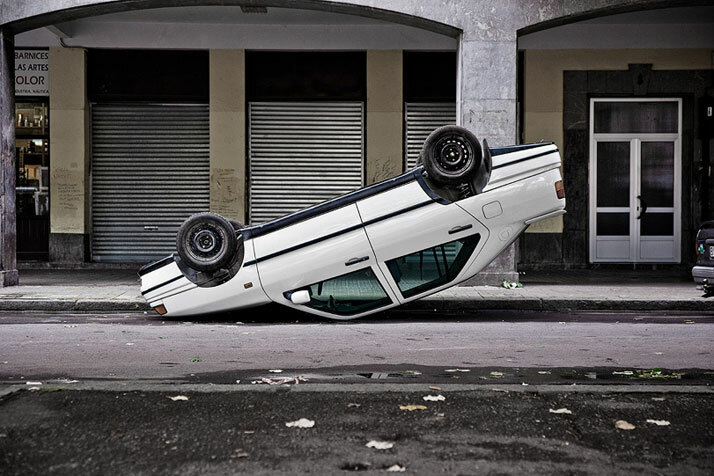 He creates art that makes the urban dweller stop in their tracks and take a moment from their busy everyday life, as they encounter work that encourages reflection, humour and new levels of consciousness in relation to what is seen or overlooked. 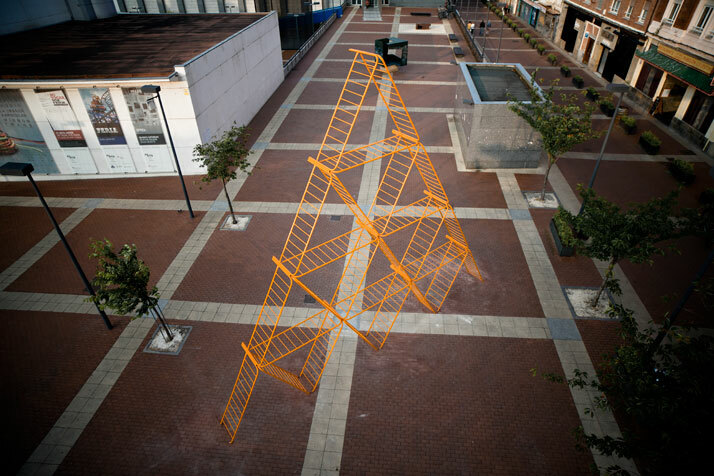 In this installation, the safety barriers that have been constructed into a bold pyramid structure that is both oddly beautiful and intriguing, demonstrates how urban outside spaces can be used as locations to showcase exciting new artwork. 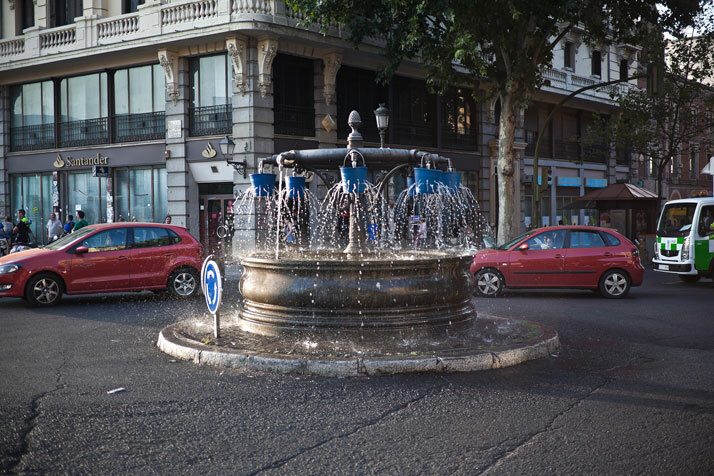 Installation of buckets with holes over a public Fountain which alter the water´s expected direction and sound. Madrid, Spain. Photo © SpY. 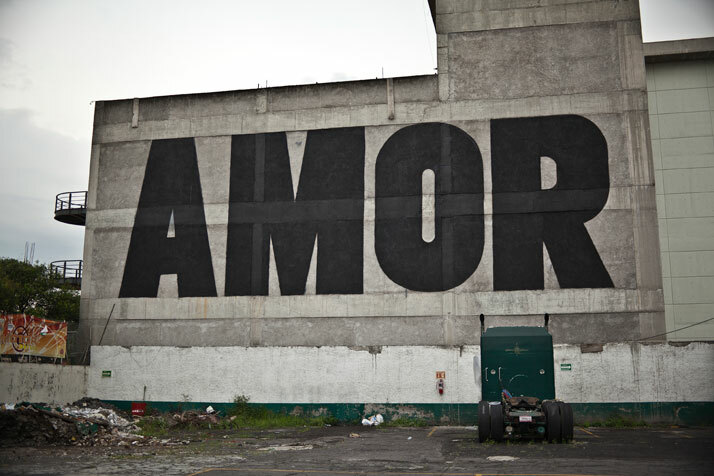 AMOR Mexico DF, Mexico, 2011. Photo © SpY. HIGH, Madrid, Spain, 2007. Photo © SpY. ROTATION, Madrid, Spain, 2011. Photo © SpY. 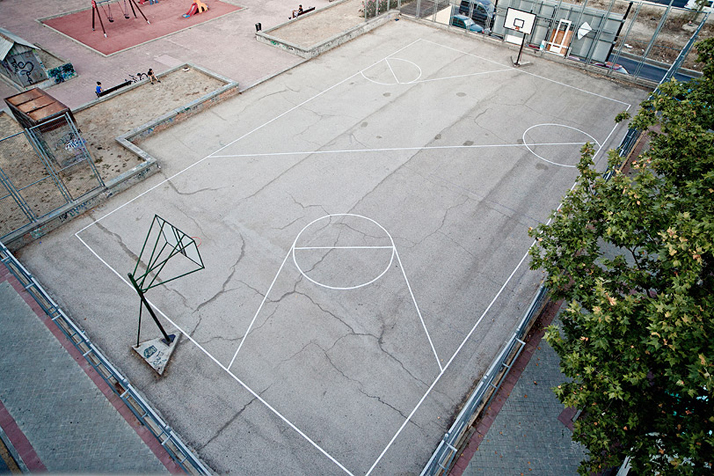 LINES, Madrid, Spain. 2008. Photo © SpY. PIRAMID, Vitoria, Spain, 2013. Photo © SpY. LEAVES, Madrid, Spain, 2009. Photo © SpY. HOLE, Rosarno - Italy, 2013. Photo © SpY.